The seven SI base units and the interdependency of their definitions: for example, to extract the definition of the metre from the speed of light, the definition of the second must be known while the ampere and candela are both dependent on the definition of energy which in turn is defined in terms of length, mass and time. 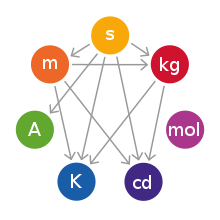 The International System of Units (SI = Systeme Internationale) defines seven units of measure as a basic set from which all other SI units can be derived. The SI base units and their physical quantities are the metre for measurement of length, the kilogram for mass, the second for time, the ampere for electric current, the kelvin for temperature, the candela for luminous intensity, and the mole for amount of substance. The SI base units form a set of mutually independent dimensions as required by dimensional analysis commonly employed in science and technology. The names and symbols of SI base units are written in lowercase, except the symbols of those named after a person, which are written with an initial capital letter. For example, the metre (US English: meter) has the symbol m, but the kelvin has symbol K, because it is named after Lord Kelvin and the ampere with symbol A is named after André-Marie Ampère. Several other units, such as the litre (US English: liter), are formally not part of the SI, but are accepted for use with SI. metre m length "The metre is the length of the path travelled by light in vacuum during a time interval of 1 / 7008299792458000000♠299792458 of a second." kilogram kg mass "The kilogram is the unit of mass; it is equal to the mass of the international prototype of the kilogram." second s time "The second is the duration of 7009919263177000000♠9192631770 periods of the radiation corresponding to the transition between the two hyperfine levels of the ground state of the caesium 133 atom." (Added by CIPM in 1997) The day is divided in 24 hours, each hour divided in 60 minutes, each minute divided in 60 seconds. ampere A electric current "The ampere is that constant current which, if maintained in two straight parallel conductors of infinite length, of negligible circular cross-section, and placed 1 metre apart in vacuum, would produce between these conductors a force equal to 6993200000000000000♠2×10−7 newton per metre of length." kelvin K thermodynamic temperature "The kelvin, unit of thermodynamic temperature, is the fraction 1 / 7002273160000000000♠273.16 of the thermodynamic temperature of the triple point of water." "This definition refers to water having the isotopic composition defined exactly by the following amount of substance ratios: 0.000 155 76 mole of 2H per mole of 1H, 0.000 379 9 mole of 17O per mole of 16O, and 0.002 005 2 mole of 18O per mole of 16O." mole mol amount of substance "1. The mole is the amount of substance of a system which contains as many elementary entities as there are atoms in 0.012 kilogram of carbon 12; its symbol is 'mol'. 2. When the mole is used, the elementary entities must be specified and may be atoms, molecules, ions, electrons, other particles, or specified groups of such particles." "In this definition, it is understood that unbound atoms of carbon 12, at rest and in their ground state, are referred to." candela cd luminous intensity "The candela is the luminous intensity, in a given direction, of a source that emits monochromatic radiation of frequency 7014540000000000000♠540×1012 hertz and that has a radiant intensity in that direction of 1 / 683 watt per steradian." New SI: Dependence of base unit definitions on physical constants with fixed numerical values and on other base units that are derived from the same set of constants. New definitions of the base units were approved on 16 November 2018, to take effect 20 May 2019. The definitions of the base units have been modified several times since the Metre Convention in 1875, and new additions of base units have occurred. Since the redefinition of the metre in 1960, the kilogram was the only unit that is directly defined in terms of a physical artifact, rather than a property of nature. However, the mole, the ampere, and the candela were linked through their definitions to the mass of the platinum–iridium cylinder stored in a vault near Paris. It has long been an objective in metrology to define the kilogram in terms of a fundamental constant, in the same way that the metre is now defined in terms of the speed of light. The 21st General Conference on Weights and Measures (CGPM, 1999) placed these efforts on an official footing, and recommended "that national laboratories continue their efforts to refine experiments that link the unit of mass to fundamental or atomic constants with a view to a future redefinition of the kilogram." Two possibilities have attracted particular attention: the Planck constant and the Avogadro constant. In a note to the CIPM in October 2009, Ian Mills, the President of the CIPM Consultative Committee - Units (CCU) catalogued the uncertainties of the fundamental constants of physics according to the current definitions and their values under the proposed new definition. He urged the CIPM to accept the proposed changes in the definition of the kilogram, ampere, kelvin, and mole so that they are referenced to the values of the fundamental constants, namely the Planck constant (h), the electron charge (e), the Boltzmann constant (k), and the Avogadro constant (NA). This approach was approved in 2018, only after measurements of these constants were achieved with sufficient accuracy. ^ 23rd General Conference on Weights and Measures (2007). Resolution 12: On the possible redefinition of certain base units of the International System of Units (SI). ^ Ian Mills, President of the CCU (October 2009). "Thoughts about the timing of the change from the Current SI to the New SI" (PDF). CIPM. Retrieved 2010-02-23.